Whoa, the difference a year makes: On Jan. 1, 2015, my main computing devices were 13.3-inch MacBook Pro Retina Display, iPad Air, and iPhone 6—oh yeah, Apple Watch, joined them six months later. 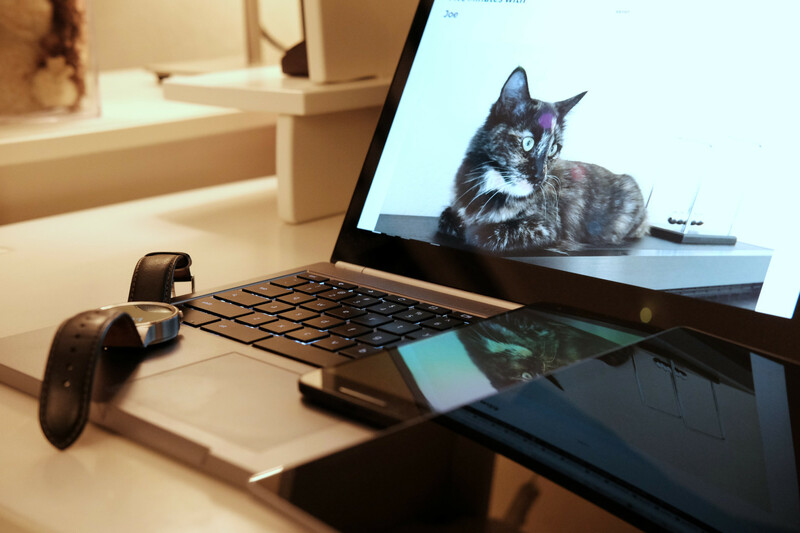 My mainstays at the start of 2016: Chromebook Pixel LS, Pixel C, Nexus 6P, and Huawei Watch. I abandoned Apple and there are no plans to return. I choose the Google lifestyle instead. I have changed computing platforms too often during the past two decades. From the December day in 1998 when carting iMac out of CompUSA, no matter what the switch, I always returned to Apple products, even after boycotting the company during second half 2012. My last rally was months ago, before giving up Apple Watch, iPad Air 2, iPhone 6 Plus, the 6s Plus (for a single day), and MBP. I don’t expect to ever go back. The allure is gone. Apple tech has gone astray, what I called in September 2015: “products without purpose“. No matter how much revenue the Apple machine generates from last year’s new releases, each and every one represents failure to innovate. Apple Watch is more fashionable than functional. One-hundred dollar discounts from Best Buy and Target during the holidays hint at real sales demand, or lack of it. Best Buy slashed $300 off 12-inch MacBook’s MSRP, bringing the starting price to more reasonable $999. The laptop is pretty, and it sports clever keyboard and magnificent display, but the performance is more comparable to a budget Chromebook. iPad Pro is overly-large, and the dimensions, which remind of a giant iPhone, make the thing somewhat unbalanced in the hands; it’s awkward. There is something retail sales-like about the 12.9-inch screen—think pricing an item $9.99 because $10 emotionally feels so much more costly. The screen is 13 inches, as in laptop-size. Meanwhile, I wonder how much Scott Forstall’s departure affected Apple software development. The quality feels inferior to stuff sold two years ago and overall development is stagnant. Apple fails to advance more sensible user interface motifs, such as voice, while clinging to touch and keeping the look and feel of iOS and OS X where they were a half-decade ago. But my computing reflection isn’t about Apple, other than to regretfully state that the aspirational pull is gone. I made the last return to the Apple Way under the mistaken belief that the platforms provide the best creative tools for photography, videography, and podcasting. I was surprised how much zippier was the Chromebook Pixel compared to MBP, or how noticeably longer webpages loaded in Safari on the Apple compared to Chrome on the Google. The difference isn’t UI so much as UX—user experience. Apple platforms have better all-around selection of apps than any competitors’ offerings. But Google gives greater context, and the apps are more than good enough and some are better. Android and Chrome OS make fewer demands on my time, and the overall experience is less distracting, which improves my overall creative mindflow and workflow. I developed the principles thinking of single products, like the CD displacing vinyl records, DVR and program guide replacing VHS recorder and motion buttons, or the DVD dislodging VHS movies. Google imbues the principles as a design philosophy around contextual relevance and synchronization, rather than single product(s). The company’s user interfaces may not be the prettiest (like yucky Gmail) but built in through-and-through is hidden complexity and pushed-forward simplicity by presenting the user with what he or she needs anytime, anywhere, and on anything. Consider Chromebook setup. There are two major steps: Connect to WiFi network; type in Google account info. Done. While easier today than a half-decade ago, setting up a new Mac can be an hours-long affair, depending on whether starting fresh or transferring settings and files from another computer. Google hides complexity and makes the process simple. Take as another example Google Photos, which in May 2015 I praised for being “disruptive innovation“. If I shoot a pic on my phone it syncs to Google Photos in the cloud. If I use my camera and put the SD card into the Chromebook Pixel LS slot, Chrome OS detects new images, uploads them to Google Drive, and they appear in Google Photos on any device. Apple syncs photos, too, but the process is nowhere as efficient, doesn’t always work immediately, and too often requires some user intervention. Google Photos sync is a hands-free process. There are superior photo management tools available for iOS or OS X compared to Android or Chrome OS. But they require greater time investment to get the benefits. I can manage Google Photos using search, which efficiently finds what I want (most of the time) without tagging being required. The list of benefits across platforms, apps, and webapps is too long to further state now. Android, Chrome OS, and their supporting apps meet most of my productivity needs, while the Google cloud gives contextual information when and where needed. Google Now and Now on Tap are among the contextual services to provide information where I want and when it’s needed. That, my friend, is true innovation. For years, I always came back to Apple, even when switching to use another platform for work purposes (usually writing tech stories about it). I never strayed far. Apple designs made me happy and I got more work done in less time than, say, using Windows. But looking at the second half of the 21st Century’s second decade, Google out-innovates Apple, with products/services that offer me time-saving, contextually-relevant benefits. I will write more about Google in 2016 than previous years, because of the benefits I see. As for Apple, the company had my heart for the longest time. I challenge CEO Tim Cook to win back my adoration; skeptical I may be. And talking about innovation, Inbox is replacing Gmail with a better and more logical interface (I love it! ), and also the search tool for Google Photos is evolving every day (in a kinda scary way), it has face, places and things recognition, so don’t need to use keywords.